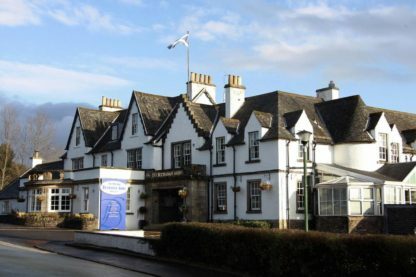 Just 5 minutes from Loch Lomond, The Buchanan Arms Hotel & Leisure Club offers free parking and free Wi-Fi. With a whisky bar, stylish rooms and a restaurant, there is also a leisure club. The elegant bedrooms at Buchanan Arms Hotel each have a private bathroom with free toiletries. All rooms have a trouser press, hairdryer and TV, and many have scenic views of the local countryside. The Salmon Leap Restaurant serves traditional Scottish cuisine using local produce. The well-stocked bar offers a collection of local whiskies and fine wines, and a buffet breakfast is served daily. The Buchanan Club features an indoor swimming pool, hot tub, sauna and steam room. There is also a modern fitness centre with squash courts and aerobics classes. Buchanan Hotel is situated in the conservation village of Drymen, in Loch Lomond and the Trossachs National Park. Glasgow centre can be reached in just 30 minutes drive.